Location: At the S corner of the churchyard of St Lawrence at Gumfreyston. Gumfreston is traditionally Eglwys Gunniau, birthplace of St Teilo in the 5C, and the present church is probably on a much older church site. The proximity of the wells to the church suggests this is a clear instance of a Christian site chosen in the Dark Ages to absorb an earlier pagan well-cult. 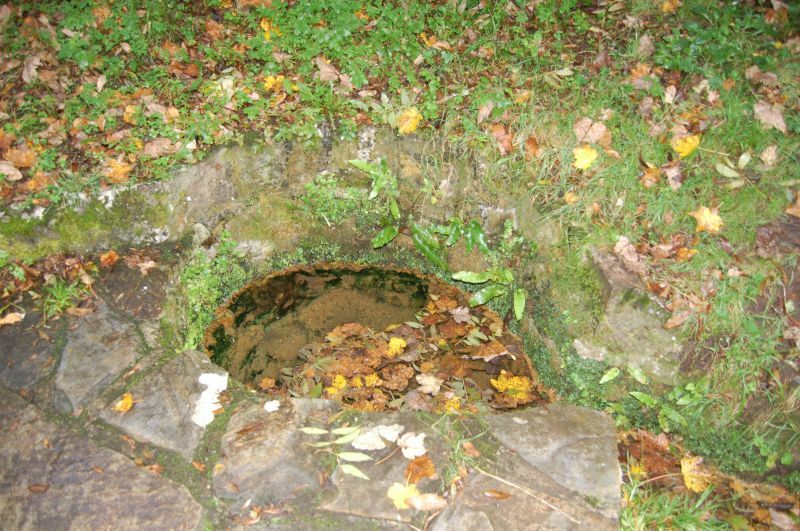 There are three wells in a small group, apparently originating in two natural springs. It was customary down to the C17 for bent pins to be dropped into the water to mark the end of Lent; the practice was called 'throwing Lent away'. The reputation of the wells continued down to the C19; Gosse, who visited in 1861, says that traditionally the lowest of the three had a healing reputation, and leading down to this there was a worn masonry step. Some attempts were as made by fashionable physicians in the C19 to promote the healing properties of the water on medical grounds for invalid visitors to Tenby, but they came to nothing. A group of natural springs with carefully formed stonework around each. There are three shallow wells, the water of which flows together into one stream and leaves the churchyard to the S. The stonework simply confines the wells and the channel through which they run together; there is no superstructure. The water of the one nearest the church was described by Gosse as pure spring-water, the other two as of chalybeate type, i.e. impregnated with iron, and exceptionally soft and naturally sparkling, with red sediment and occasional eruptions of gas. Listed as ancient holy wells forming an historically important group with the church. 150 m S of the B4318 in Gumfreston. 50 m N of Carswell Farm House, in the farmyard. It is the western of the two ruined buildings. Set in its own grounds on the S side of Heywood Lane some 250m E of Clickett Lane. Set in its own grounds on the S side of Heywood Lane some 300m E of Clickett Lane. At the entrance to Kiln Park caravan site, at the N side close to the filling station, on the E side of the A4139. The kiln is related to the extensive Black Rock quarries at its rear. Situated on the N side of Marsh Road against the garden wall of Springfield some 30m E of Churchill Close. Located at the N end of Penally village, at the E of the main village street. At the front of the site is a paved forecourt with a rendered wall and gate piers.